Back to pears, to tell you the truth I guess I’m not a huge fan of most of the grocery store pears. It pains me a bit to admit that. I like them, but I realized today that I never ever reach for a pear and I never crave them. Even the Starkrimson Pear, which I loved, I haven’t bought since then. Really, I see them more as a vehicle for pairing up with cheese and wine, which is a pretty legit function for any food in my book. The closer you can get me to cheese and wine, the better. Keep that in mind next time you want to wine and dine me. Also, bring an extra $5. I’ll be printing up some “Golden Princess Apple” labels soon. 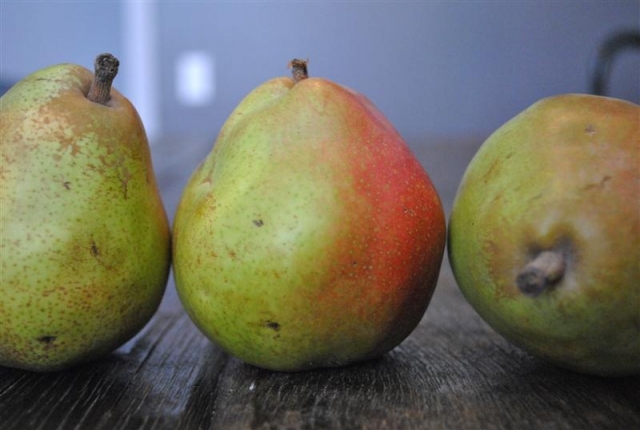 Frumpy, bumpy chubby pear that is mostly green with a russet top and red blushing. White flesh. Very slight smell of dandelions. Delightfully soft and creamy but with a characteristic grainy finish and a gritty peel. Explosive juice that shoots across the room and drips down the chin. Grab a bib! Sweet but mild pear flavor with a little lemony touch. Oh Comice, why must you be so gritty? The flavor of this pear is great and the level of juice just makes it feel extremely decadent. You can’t really help but laugh while eating it because it is such an indulgent mess. Pretty highly recommended if you are a pear person. One huge plus for this pear is that it is originally from France. Like many girls, I have a huge crush on France and on Paris in particular. I’m pretty sure someone needs to whisk me away on a pear excursion to the city of love. Anyone? Anyone? Buehller? When in season, you can buy Comice Pears at your standard grocery store and online here or the fancy ones through Harry and David here. If you get them online, a small amount will go to support the Fruit Maven. So thanks in advance!